Silk Road Place. 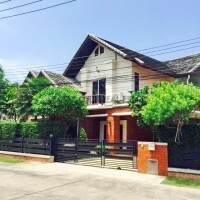 This communal village has proved a very popular choice for European Ex pats looking for a full, or part time holiday property within easy reach of Jomtien beach, or Pattaya city. Jomtien beach is just a 5 minute drive, and is now starting to be developed to include plenty of activities, services, and amenities. Pattaya city is just 15 minutes away. Silk Road also boasts some fantastic communal facilities such as a tropical pool, gym, tennis court, children's playground and club house. Also simple but effective village designs, such as underground electricity, wide landscaped roads, CCTV throughout the village, friendly staff and security guards. This immaculate 3 bedroom home has been well kept and in excellent condition. The owner has chosen very carefully the lavish furniture, to set this house apart in the village. Around the property there is a small garden, covered patio, gazebo, and an inviting private swimming pool. The title deed is held under a Thai name and transfer fees are to be split equally between both parties.